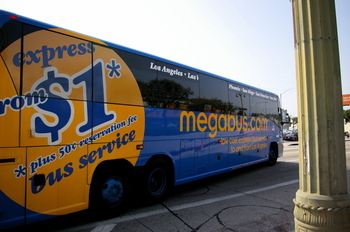 Posted on Mon, Jan 23, 2012 : 9:49 a.m.
Discount transportation service Megabus is adding a route from Ann Arbor to Toledo, the Toledo Blade is reporting. Megabus will start offering rides from Ann Arbor to Toledo. The company — which picks up and drops off riders at the State Street commuter lot across from the Howard Cooper Honda dealership — already sells rides to Chicago. Now, Megabus will sell tickets from Ann Arbor to Toledo — although it will take 2.5 hours to get there because the bus will stop first in Detroit, the Blade reported. The route starts March 14. From Toledo, Megabus offers connections to Cleveland and Pittsburgh. "We'd had a lot of requests from students at the university in Ann Arbor," Bryony Chamberlain, the company's director of operations, told the Blade. Tue, Jan 24, 2012 : 3:02 a.m.
Who designed this route - Amtrak?? Haven't they heard of US 23? Mon, Jan 23, 2012 : 6:24 p.m.
Mon, Jan 23, 2012 : 4:31 p.m.
Horrible! Our children could ride this FOR PROFIT bus. The stop is so close to Balas Building that the intent is clear. Council must immediately outlaw greedy busses stopping in Ann Arbor in competition with AATA and AAPS planned future expansion. Mon, Jan 23, 2012 : 7:04 p.m. Indeed, a public-funded service that carries children to school has so much in common with a private company that carries people hundreds of miles. Please tell me more about your proposals for improving AATA and AAPS, or maybe just some more sarcasm. Mon, Jan 23, 2012 : 4:24 p.m. This is a welcome addition for many who live in northern Ohio as well as those of us who want to catch Amtrak headed East but don't want to go to Chicago to catch the train. I hope the schedules somewhat coordinate with the Amtrak schedule (although we know how reliable the Amtrak schedule can be...). I've had great experiences on MegaBus - clean, friendly and fast. Tue, Jan 24, 2012 : 2:36 p.m.
Not a smarter path when the bus originated in Chicago. Ann Arbor is an easy stop on the way to Detroit (and on to Toledo). 2.5 hrs is kind of a long wait. I'd be happier if the trip from Detroit came to Ann Arbor and then Toledo, seems a smarter path. Mon, Jan 23, 2012 : 3:46 p.m.
Ron, Not a direct flight. You have a lay over in scenic downtown Detroit. Mon, Jan 23, 2012 : 3:38 p.m.
2.5 hours? And what is the cost? Google maps shows it is 65 miles and puts the travel time at 70 minutes. This is the elephant in the room. Some people want to burn billions on &quot;high speed&quot; rail when we don't even have good basic bus transportation. If you can't make buses work fast and cheap, what makes you think you can handle burning billions to make trains work? Tue, Jan 24, 2012 : 4:13 p.m. Thank you. I stand corrected! They have $1 fares. Btw, I did check for February Toledo fares and didn't see them. After several attempts, and many $35 fares to chicago, I didn't bother to play hunt and peck with the schedule. I totally agree with the replies given. This is a boon to the area to get people to and from this area to others that need the ride. Less cars and less ozone burning. AATA can help get others around if need be. My mother did the Chicago one and loved it. I plan to use them this summer for a weekend jaunt to Chicago. Plus with family along the way what a way to see the area. Great news. Mon, Jan 23, 2012 : 7:29 p.m.
My daughter rides the Megabus to and from Pittsburgh all the time. Currently, she has to take the Greyhound to and from Detroit, with the Detroit/Pittsburgh link on the Megabus. They do indeed have a limited number of $1 seats available (I've used them to Chicago and back), and then the prices slowly rise as the remainder of the tickets sell. From Detroit to Pittsburgh, taking the Greyhound takes approximately 9 hours (including a stopover in Cleveland, and several short stops on the way). Megabus makes one stop on the turnpike for approximately 20 minutes for riders to get food/use the restroom/stretch their legs, and the total time is about 5 hours. Not too much shorter than actually driving, and you save the gas and toll fees. The buses are spacious and well maintained. Not a bad way to go. Oh...and Megabus is a private company, not publicly funded, so it really has very little to do with public transportation. Mon, Jan 23, 2012 : 7:01 p.m.
Ron, just because you have trouble using a website doesn't mean the information isn't there. I could buy a round-trip ticket right now from Ann Arbor to Toledo in late March for $2.50 (including a massive $0.50 service charge) from Megabus.com. A trip around the same time To &amp; From Chicago would cost me $11.50. Of course, if I wanted to take a round-trip bus trip to Chicago this week, it will cost me in the realm of $50-90 depending on the day &amp; time I want to travel. Not much different from air travel, in that regard. Mon, Jan 23, 2012 : 6:49 p.m.
Mon, Jan 23, 2012 : 6:01 p.m.
Ron, try doing some research on their site before you bash things arbitrarily. The service hasn't started yet (I don't think). if you put in some future dates, you indeed get a quote for.... wait for it.... $1 tickets! I'll take that bridge though, sounds like a good deal. Mon, Jan 23, 2012 : 4:43 p.m. So you see &quot;$1&quot; on the side of a bus, and you seriously think the fare is $1? If so, I have a bridge to sell you. Their website does not provide fare information to toledo. So yeah, too tough for me to figure out. If it's so easy, post the actual fare. Mon, Jan 23, 2012 : 4:25 p.m.
Hell, even the picture in the article says $1 up, what is the disconnect here? Too tough for you to figure out? If you were truly interested, you would have clicked on the link to see that they range from $1 up, depending on when you buy the ticket. Mon, Jan 23, 2012 : 3:56 p.m.
Huh? There is no &quot;we&quot;, it's a private business. And we're quite capable of running buses from Ann Arbor to Toledo in 70 minutes, this company has just decided that it's more profitable to stop in Detroit first.